19 Jun 1982. Michael Guiry. © Michael Guiry (mike.guiry@nuigalway.ie). Published in: Maggs, C.A. & Guiry, M.D. (1985). Life history and reproduction of Schmitzia hiscockiana sp. 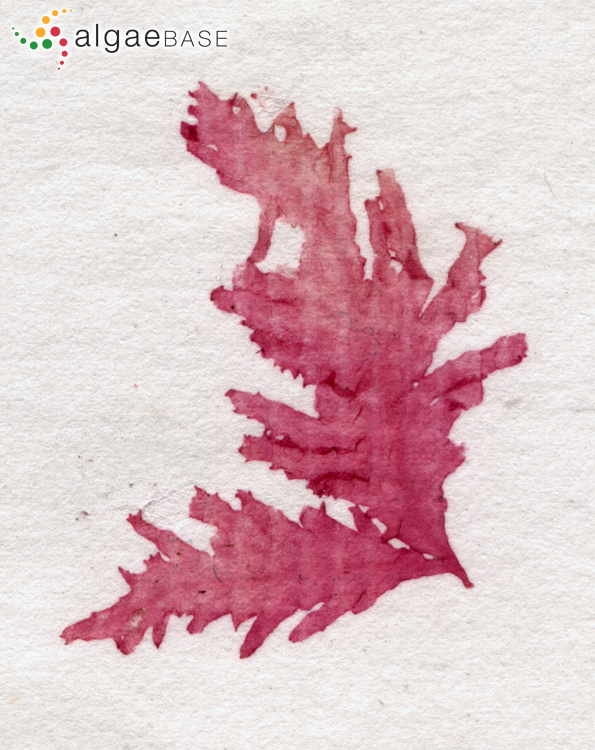 nov. (Rhodophyta, Gigartinales) from the British Isles. Phycologia 24: 297-310. The type species (holotype) of the genus Schmitzia is Schmitzia neapolitana (Berthold) P.C.Silva. English: Lobed Jelly Weed (Bunker et al. 2010). Type locality: Bardsey Island, Wales. Holotype: C.A. Maggs & C. Lumb; 19 August 1983; on pebbles at 13 m. GALW (Maggs & Guiry 1985: 299). Notes: Isotypes in BEL, BM, MEL. UBC, US. Karlsson, J. (1990). On the occurrence of the genus Schmitzia (Rhodophyta, Gigartinales) on the Swedish West Coast. British Phycological Journal 25: 367-374. Lein, T.E., Bruntse, G., Gunnarsson, K. & Nielsen R. (1999). New records of benthic marine algae for Norway, with notes on some rare species from the Florø district, western Norway. Sarsia 84:39-53.. Sarsia 84: 39-53. Accesses: This record has been accessed by users 1909 times since it was created. Maggs, C.A. & Guiry, M.D. (1985). Life history and reproduction of Schmitzia hiscockiana sp. nov. (Rhodophyta, Gigartinales) from the British Isles. Phycologia 24: 297-310.